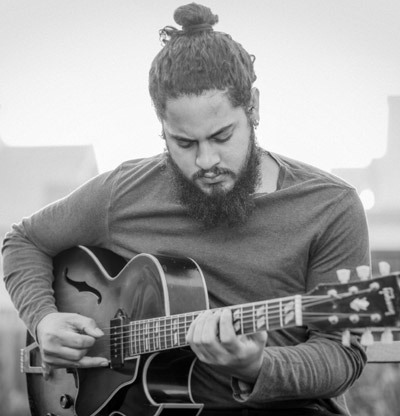 Keenan Ahrends is a Cape Town based Jazz guitarist who started playing at the age of fifteen. After completing his jazz performance studies at the University of Cape Town and the Norwegian Academy of Music in 2009, Ahrends has been actively involved in performing ,composing and teaching. During his tertiary studies, he studied under the likes of Jon Eberson, Eckhard Baur, Alvin Dyers, Andrew Lilly, and Mike Campbell. Ahrends has collaborated with established musicians such as Louise Moholo, Andile Yenana, Afrika Mkhize, Buddy Wells, Mark Fransman, Shane Cooper, Sony recording artuist SOMI (USA), Salim Washington (USA) and Kevin Gibson amongst others. Ahrends has been commissioned to compose works for the Cape Town Goema Orchestra(2012, 2013, 2014) and regularly performs his compositions with his own Trio.